Spectrum/Red Dot Art Fairs 2019! Art & Beyond Magazine is the best self-promoting tool for artists in all medium and is available to artists 18 years of age or older from U.S. and abroad. $50.00 (U.S.) is a non-refundable jury fee for the Cover Competition (included to the price of the purchased Full Page article), for 1/2 article $50.00 Entry Fee to participate in the Cover Competition is an additional Fee and you can make your payment here. Please read instructions on the page prior your payment. 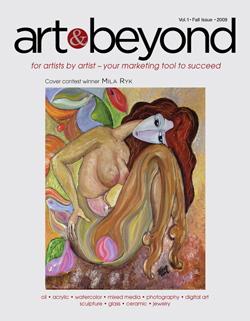 The winning artwork will be published on one of the covers of Art & Beyond free of charge. Artists who purchase space in the magazine will receive complimentary printed copies of the issue (Full Page – 3 copies, 1/2 Page – 1 copy) to use as a promotional tool (S+H included for US only). Additional copies artist can buy from the publisher for $12.95 per copy, which includes ALL associated shipping and handling costs for US only, additional price information for the International shipping will be send via email. * Front Cover, Back Cover, Inside Front and Inside Back Covers will be given as an award to those who purchase content page (free of charge) in addition to the purchased article. These options will be available for a limited time only and may not be available by the time you applied. *All payments by PayPal are include the service fee. Digital images send by email or FTP in the format of a JPG/TIFF as 300 DPI image files; no less than 9 inches wide. • List of artwork in word document must reflect the image file name and the Title of the artwork including medium and dimensions of each artwork supplied to be published. • A short biography in the form of an essay or a critique up to 100 words for 1/2 Page, up to 300 words for Full Page or up to 400 words for 2-page submission in MS Word document format. It must include your contact information along with your website if applicable. If you wish to Apply by mail please send request to order PDF Form. • Cancellations are accepted only 1 day after the submission made and refund will reflect transection/service fee from the payment made. • Additional charges will be applied for shipping to foreign countries and must be included with your Entry Form. • The Publisher reserves the right to reject certain artwork or artists for any reason; including but not limited to the quality of the submitted images and the overall content. • There are no additional charges for the scanning of artwork, basic editing and/or proofreading of supplied materials from an artist. • Art & Beyond will not be held liable or responsible for any printing errors. • Please note that the printed images never match materials 100%. • Placement of editorials is in an alphabetical order by sections. Special placements will not be offered and/or considered. • The page(s) layout in PDF format will be emailed for proofing prior to the printing of our publication. Please consider that proofs do not represent a good match for color reproduction and are thus used for reference purposes only. Proofs must be approved by an individual artist within 24 hours of receipt by Art & Beyond. If approval or corrections are not received and thus approved on time, Art & Beyond is not responsible for printing any incorrect information. • There are no additional charges for the shipping of up to five printed copies in the Continental United States. • Supplied materials and images will be returned only if a SASE (Self Addressed Stamped Envelope) is provided with your submission. • Art & Beyond is not responsible for any loss or damages incurred from the shipment of your submission materials. 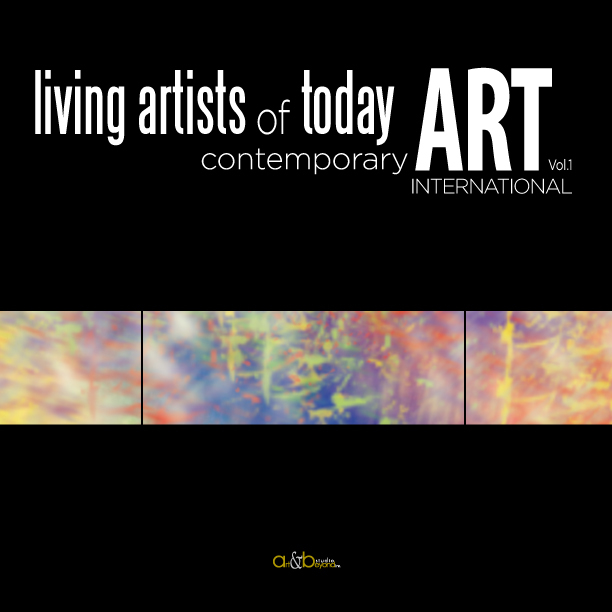 • Art & Beyond cannot guarantee your acceptance to art galleries, art museums or publishers. • By signing the Entry Form you agree that after your artwork is accepted and published in Art & Beyond that all payments are final. • Entry Forms without full payment will not be processed. • Entry Forms with payments made by Personal Check are subject to a clearance period of ten (10) business days. • Returned personal checks will result in additional $15.00 fee. • Notification of acceptance will be sent via email communication. Please enter requested information in the Entry Form below. After Application Submitted please get back to this page and click here to make a payment. Payments accepted: PayPal (online submission), money order, cashier’s checks and personal checks (submission by mail only). All your entry information can be submitted by email to: mryk@art-beyond.com or using www.sendbigfiles.com free server to the provided email address. I will send submission by email to mryk@art-beyond.com as a zipped files (in one or more emails) with my Name and Competition category in the subject line. I will upload my submission on to www.sendbigfiles.com as one zipped file named as my Last Name and my Name and the Competition Category in the subject line. I will notify you by email to mryk@art-beyond.com or phone 847-581-0518 when it’s uploaded. I would like to upload my submission by FTP. Please provide access to my email submitted above. I will be mailing my submission on USB drive with all required materials to P.O. Box 994, Morton Grove, IL 60053. All entries submitted to the Art & Beyond Magazine must be original work. The artist must be the sole owner of the copyright of the submitted images/artwork. Artists accepted to be published will retain full copyrights of their images. Submitting the Entry Form gives Art & Beyond Studio, Inc. the authorization and permission to utilize submitted materials for publication as well as marketing purposes including publicity by Art & Beyond Studio, Inc.